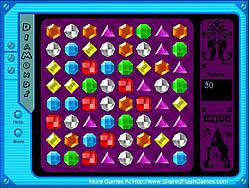 Move Diamond Game - FunGames.com - Play fun free games. Click two adjacent diamonds to exchange them. If three or more diamonds are in a fun game line, the diamonds will be cleared, and 10 points will be credited to you per diamond. The fun game is over if no diamond can be cleared.